You already have to spend enough money skipping work, transporting the whole gang to Central Florida, and doing tours of Universal Orlando, Disney World, and the like. If you are ready to explore the rest of the town and give your savings account some well-deserved rest, here are 20 ideas for free or inexpensive entertainment all around Orlando. The Lake Eola water fountain. #2 Park Ave in Downtown Winter Park: Bordered by a shady park that plays host to concerts and art festivals, Park Avenue is home to one-of-a-kind boutiques and well known shops, sidewalk cafes and world class restaurants, as well as world-renowned art collections in the area’s museums. #3 Harry P. Leu Gardens: Admission is free on Mondays. Guests can enjoy three miles of walkways, rose gardens, a butterfly garden, ancient oak trees, and more. #4 Ocala National Forest: A great place to experience natural Florida. The Florida Trail is a popular hike, where you can view hardwood forests, swamps, springs, and prairies. You can also canoe, picnic, hike and more. #5 Kelly Park: This park offers over 248 acres of outdoor fun and excitement! A crystal clear spring is the focus of this park, with water sports, including tubing, and rock climbing available! #7 Farmer Markets: There are weekly farmer markets in Winter Park, at Lake Eola, and in Celebration. #8 Cornell Fine Arts Museum: This museum showcases over 6,000 art pieces ranging from the Renaissance to the Baroque period. Art lovers of all ages will not want to miss one of the oldest collections in all of Florida. 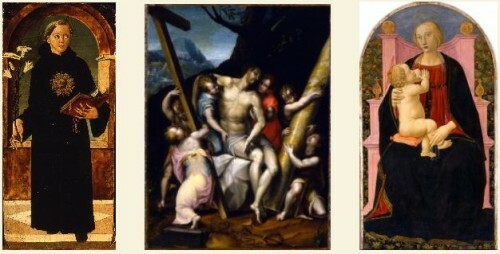 Fifteenth-century wood panel on display at Cornell. #9 Charles Hosmer Morse Museum of American Art: Home to the most comprehensive collection of Louis Comfort Tiffany. There is also an extensive American Pottery collection, as well as 19th and 20th-century paintings collection. Admission is free on Fridays. #10 Albin Polasek Museum & Sculpture Gardens: This venue holds an art col­lec­tion focus­ing pri­mar­ily on Amer­i­can rep­re­sen­ta­tional sculp­ture, with over 200 works by Czech-born Amer­i­can sculp­tor Albin Polasek. The museum offers guided tours of the his­toric Polasek res­i­dence and chapel, an out­door sculp­ture gar­den, and a gift shop. #11 Holocaust Memorial Resource and Education Center of Central Florida: An informative center dedicated to remembering the millions of people that were lost during the rule of Nazi Germany. #12 Fort Christmas Historical Museum & Park: Visit the full-size replica of Fort Christmas, including seven restored pioneer homes and showing pioneer life from the 1870s through the 1930s. Key themes are homesteading, cattle, citrus, hunting, fishing, and trapping. There are even more free things to do in Orlando, Florida! #13 the University of Central Florida Arboretum: The UCF Natural Lands are open from sunrise to sunset every day for self-guided tours. The natural areas are a wonderful place for learning, teaching, relaxing or playing. The singing fills the air outdoors at Portofino Bay Hotel. #14 Universal CityWalk and on-site hotels: While it may cost to go into the parks, you can visit Universal’s CityWalk, a multi-level entertainment complex, and only have to pay for parking. CityWalk is a mix of shopping, restaurants, and nightlife. You are also free to explore Universal’s three on-site hotels, which you can walk to or take the complimentary water taxis. 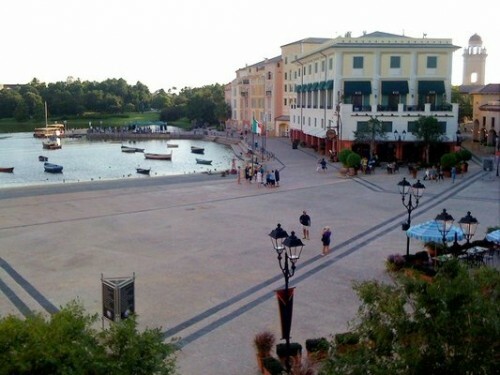 In particular, Portofino Bay Hotel showcases Italian opera singers each night in their plaza overlooking the bay. #15 Disney Springs: Explore the World of Disney store, which is an experience in and of itself. Also, visit the Lego Imagination Center, where your kids can enjoy the free Lego building stations and nearby playground. #16 Disney’s Boardwalk: Stroll along Disney’s Boardwalk for a charming step back in time, complete with water views and street entertainers. #17 Gaylord Palms: This 1,500 room resort includes three enormous, entirely enclosed atriums featuring the Everglades, St. Augustine, and Key West. Filled with multiple restaurants, many gift shops, and all the ambiance of a world-class destination, Gaylord Palms is spectacle for the senses. And it’s an excellent way to escape the Central Florida heat and humidity. #18 The Town of Celebration: Visit this Disney-made town where you can admire the gorgeous houses, well-groomed yards and magic of Disney living. Depending on when you visit, you may see machine generated snow or falling leaves. #19 Old Town: On Saturday nights a free rock-n-roll concert and a parade of 300 vintage cars are offered. #20 Mall at Millenia: A dazzling selection of international stores makes The Mall at Millenia an essential shopping destination. This exceptional collection of retailers is presented in a distinctive environment of dramatic architecture and amenities. This list is a combination of http://www.mrfreestu…/free-things-t… and http://ezinearticles…12-Free-Things… and our own knowledge.